available. Inside measurements are 7x4x4. are 10" x 4" x 4". the entire car. Includes 1 free nameplate. Additional nameplates are available. Interior dimensions are 19"L" x 4"W" x 4-1/2"H". are available. Interior dimensions are approx 12-1/2L x 5-1/2W x 4-1/2H. so you can see the entire car. Includes 1 free nameplate. Additional nameplates are available. 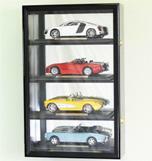 Wall mount die cast display case for 4 1/18 scale diecast cars. protection of your memorabilia collection. Price includes up to 4 free nameplates. Wall mount die cast display case for 8 1/18 scale diecast cars. protection of your memorabilia collection. Price includes up to 8 free nameplates. Solid hardwood case of beautiful design and construction. A prefect way to display 1/64th scale vehicles. NASCAR, Diecast, Mattel, Slot cars, etc. A glass door keeps inquisitive fingers away, as well as dust! scale vehicles, 1/43 scale, N scale trains, HO scale trains or other types of collectables. Playing Mantis, Fun Line, Revell, Edie cast, racingusa-online, NASCAR, Diecast, Mattel, Slot cars, etc.. Completed with a crown base and header design. with a crown base and header design. Space between Shelves: 2 5/8"
10 x 5 x 4. Our unique hinged design allows for easy access. Mounting hardware is included. 1/32 scale car display case featuring a furniture grade solid wood base and real UV protected glass and mirrored back. The base is mirrored so you can see the entire car. Inside measurements are 7x4x4. Single 1/24 scale car display case featuring a furniture grade solid wood base and real UV protected glass and mirrored back. The base is mirrored so you can see the entire car. Interior dimensions are 10" x 4" x 4". Wall mount single 1/24 scale car glass display case featuring a mirrored back, furniture grade wood frame and real UV protected glass. Interior dimensions are 10 x 5 x 4. Our unique hinged design allows for easy access. Mounting hardware is included. 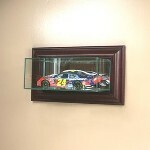 Single 1/24 scale car display case featuring a furniture grade solid wood base and real UV protected glass. The base and back are also mirrored so you can see the entire car. Interior dimensions are 19"L" x 4"W" x 4-1/2"H". 1/18 scale car rectangle display case for standard size cars. Features a furniture grade solid wood base, real UV protected glass and mirrored back panel. The base is mirrored so you can see the entire car. Interior dimensions are approx 12-1/2L x 5-1/2W x 4-1/2H. 1/18 scale car rectangle display case for longer cars. Features a furniture grade solid wood base, real UV protected glass and mirrored back. The base is mirrored so you can see the entire car. Interior dimensions are 15x5-1/4x5-1/4.